I recently had the pleasure of seeing the movie Saving Mr. Banks which centers on the development of the 1964 Walt Disney Studios film Mary Poppins. I found it to be a wonderful movie, and highly recommend it. In the film, the audience is introduced to a number of real-life characters, two of whom are Disney staff songwriters, Robert and Richard Sherman. 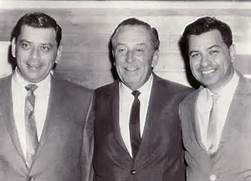 The Sherman brothers were given the task of composing songs for Mary Poppins. In 1965, they took home Academy Awards for their collaborative efforts on “Feed The Birds” and “Supercalifragilistic-expialidocious” and also won an Oscar for “Chim Chim Cher-Ee.” All three songs appeared in that classic motion picture. Arguably one of the best-known and most successful songwriting teams in history. Between 1962 and 1969, Lennon and McCartney wrote and published approximately 180 jointly credited songs, the majority of which were recorded by The Beatles. During the 1950s, Leiber and Stoller wrote songs that defined the music of the times. Many of their songs were written for and recorded by an up-and-coming young singer named Elvis Presley. It’s been said that Jagger and Richards are complete opposites in many ways, but over the course of 50 years, they have worked together to create one of the most memorable catalogs in rock history. This innovative musical theatre writing team created a string of popular Broadway musicals in the 40s and 50s including The Sound of Music, South Pacific, Oklahoma, and Carousel. Bacharach and David are considered to be one of the most successful pop songwriting teams of the 60s and early 70s, creating a legacy of elegant, timeless pop hits. For over 40 years John and Taupin have had a very simple working relationship: Bernie writes the lyrics and Elton writes the music! All the talented artists above have certainly proven that when you put two musical heads together, you just may come up with a hit!